This might seem obvious, but during my first pregnancy I tried to wing it with regular leggings and oversized t-shirts for as long as I could. Then I discovered the difference that a well-fitting pair of maternity jeans makes. And how much a gorgeous maternity dress would boost my confidence as well as make me feel so much more comfortable. Sure, maternity clothes can seem expensive but it is worth investing in a few lovely pieces to make a capsule pregnancy wardrobe so you look and feel good. Many maternity items these days are designed to be good for breastfeeding as well, so they'll often last beyond pregnancy, too. Even if you don't end up with stretch marks your skin takes an awful lot of strain during pregnancy and can feel uncomfortable. I didn't get any stretch marks with my first two pregnancies and so far I have none this time either, but I always get really itchy skin and can certainly feel that my skin is taking a beating. I have always sworn by using decent anti-stretchmark products to keep my skin feeling supple during pregnancy and this time around I have been using the Secret Saviours band and products since I was sent them at around 20 weeks pregnant. Often I hear people say that there isn't anything you can do to stop stretch marks, but actually you can! Secret Saviours is clinically proven to prevent them with its unique band which supports the skin and effectively holds it together as your belly is growing and stretching. You also get a day gel which helps prepare the skin for the band and keeps it feeling soft, and a night cream which soothes and moisturises through the night. I'll be posting an update about stretch marks once the baby is here to so do check back if you want to know if Secret Saviours worked for me. Fingers crossed! You need one. No arguments, you do! Especially when you get over halfway through your pregnancy and your tummy is getting bigger and you can feel everything started to loosen up. I sleep with mine supporting my bump as I lie on my side, and also pop it between my legs which really takes the weight off my hips. 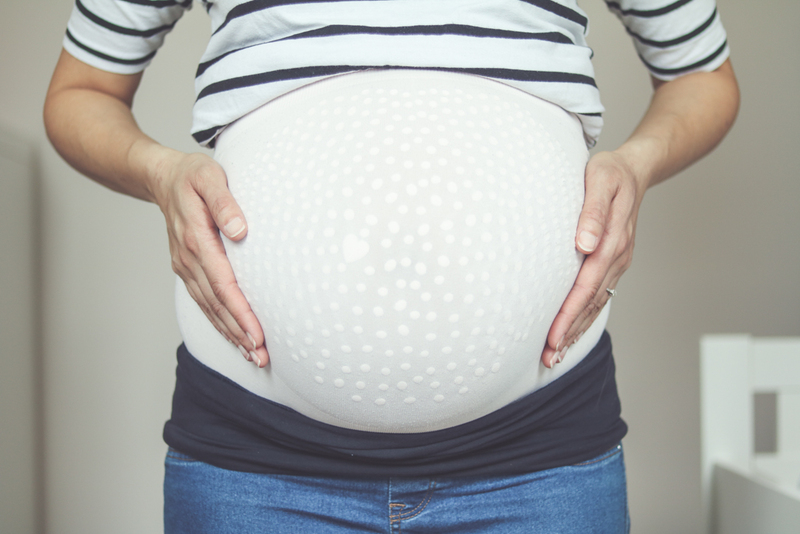 I have tried loads of pregnancy pillows during my three pregnancies and without a doubt the one that I am currently using is the best one I have ever tried. It is the Original U-Shaped Pregnancy Pillow which was sent to me by Snuggle Up. It is huge and takes up nearly half of my king-sized bed, but it is like sleeping in a great big cuddle! It provides support to my head, back, bump and legs and the filling does not lose its shape at all, no matter how much I squash it or roll around. It's also good for providing my back with support when I am sitting up in bed reading or working, and no doubt it will be useful once the baby is born, too. This is something totally new to me this pregnancy and something I started doing after getting quite a lot of achiness across the top of my bump as it has gotten bigger. I felt that I could do with a bump support to lift and take the weight a little, and a friend suggested using my stretchy wrap to support my belly. I gave it a go and the difference it has made is incredible! I don't wrap my bump all day as I have read that it is best to only do it for a few hours a day so that the muscles don't get weaker. I posted a picture of my wrapped bump on Facebook, and if you search YouTube you'll find several simple tutorials explaining how to do it. I know that it can be really difficult to fit any sort of exercise in during pregnancy, but if you can get to a yoga class or do some pregnancy yoga at home, it really helps keep your muscles feeling relaxed and can even be helpful during labour. During my first two pregnancies I attended Daisy Birthing classes but this time around I just don't have the time. Instead I have got the Tara Lee Pregnancy Yoga DVD so that I can practise at home. How do you stay comfortable during pregnancy?